GRANTED Patent - An external combustion engine comprising cylinder, a piston reciprocally mounted within the cylinder, a connecting rod extending from the piston and two spaced-apart rollers mounted on the connecting rod, wherein a first one of the rollers is adapted to engage primary cam(s) and a second one of the rollers is adapted to engage secondary cam(s), the primary and secondary cam being affixed to, and rotatable with, a common output shaft. In a conventional crank the piston movement is sinusoidal and the power and exhaust stroke are identical. Greater efficiencies can be achieved by shortening the exhaust cycle and lengthening the power cycle, accelerating the piston to optimised velocities during the power stroke to allow further heat and energy transfer and decreasing the time when the piston passes the exhaust and inlet ports. No sliding components, minimal friction and fully balanced. This is the only fully balanced piston engine mechanism since there is no crank for each piston. This would make a very efficient, powerful steam engine! 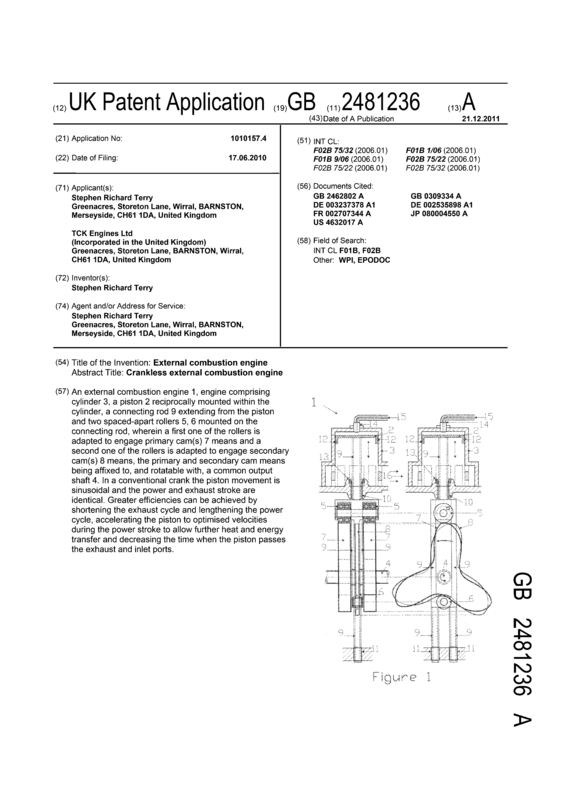 Page created at 2019-04-26 17:48:49, Patent Auction Time.